Houghton Mifflin Harcourt, 9780544800632, 256pp. 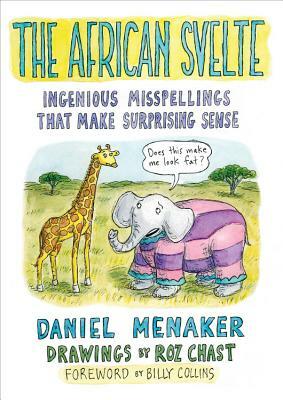 During his time at The New Yorker, Daniel Menaker happened across a superb spelling mistake: “The zebras were grazing on the African svelte." Fascinated by the idea of unintentionally meaningful spelling errors, he began to see that these gaffes—neither typos nor auto-corrects—are sometimes more interesting than their straight-laced counterparts. Through examples he has collected over the course of his decades-long career as an editor and writer, he brings us to a new understanding of language--how it's used, what it means, and what fun it can be. Illustrated by the inimitable Roz Chast, with a foreword from former poet laureate Billy Collins, The African Svelte offers thoughtful and intelligent exit Jesus. Menaker glances at familiar fumbles like "for all intensive purposes" and "doggy-dog world," but readers delighted by language will find themselves turning the pages with baited breath to discover fresh howlers that have them laughing off their dairy airs. DANIEL MENAKER began his career as a fact checker at The New Yorker, where he became an editor and worked for twenty-six years. A former book editor, Menaker is the author of six books; he has written for the New York Times, the Atlantic, Parents, Redbook, and many others. ROZ CHAST was born in Brooklyn, New York. Her cartoons began appearing in The New Yorker in 1978. Since then she has published hundreds of cartoons and written or illustrated more than a dozen books. Her memoir Can We Talk About Something More Pleasant, Please? was a #1 New York Times bestseller and a 2014 National Book Award Finalist. "A clever book... Leavened by famously jittery drawings from Roz Chast, The African Svelte cleverly educes the 'literally poetic justice' of 'eeking out a living' or disguising your terrorist intent by 'wearing a baklava.'" "The African Svelte is a whole new comedy of errors. I like to split my bridges." "Haul out the chaise lounge. Daniel Menaker has defied the spell checker tenaciously and redeemed the misspelled word with playful acuity. The department of corrections will never be the same. Paddy O’Furniture forever." "Call them eggcorns, malaprops, or ‘sveltes’— for Daniel Menaker, those happy accidents are the occasions for witty excursions down linguistic roads not taken. He had me from the gecko." —Geoff Nunberg, author of Going Nucular and language commentator, NPR "Fresh Air"
"I've made a lot of missteaks, but none of them have been as smart or as funny as the ones in this book."